Performing Songwriter’s Final Issue Collector’s Edition! 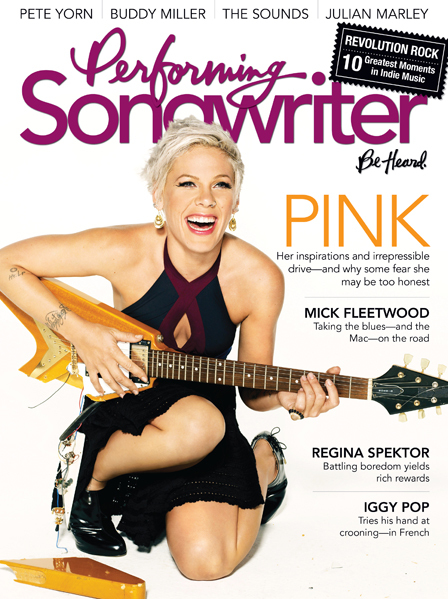 Features interviews with Pink, Mick Fleetwood, Iggy Pop, Regina Spektor, Buddy Miller, Carla Olson, Paul Carrack, Holly Williams, Patrick Watson, The Sounds, Sarah Siskind, Grizzly Bear, Pete Yorn, Julian Marley and Nanci Griffith. Special Feature on the 10 Greatest Moments in Independent Music, Behind the Songs feature on “Moon River,” Performer to Performer by Maura O’Connell, Salute to Marilyn Bergman, and Jill Sobule’s column on Songwriting as Revenge! Henry Diltz’s Parting Shot: David Cassidy and the UCLA Cheerleaders.